Hello! 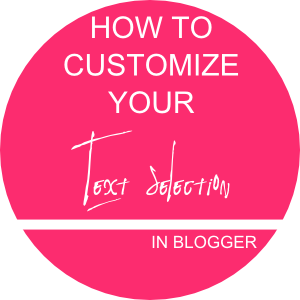 Today I am to share with you how to customize colors of your text selection! Don't know what text selection is? When you click and drag across words on a page, to select text, text selection is that blue and white overlay. 1. Log into your blogger account and select the blog in which you'd like to customize. 2. Go to Template >> Customize >> Add CSS and paste the below code into the box. 3. Save your changes and voila! To change the color of the background of your text selection change BOTH of the "#EEEEEE" in the code to your preferred color choice. And to change the color of the text, change both of the "#999999" in the code. Hey Rosie - is this for changing font or just color?